The Asian Pacific Fund celebrates Asian Pacific American Heritage month, with the announcement of the 2017 Growing Up Asian in America contest winners. The contest is one of the largest youth programs celebrating Asian Pacific American Heritage Month in the nation, and it has become a meaningful way for young people to explore their unique stories and aspirations. Since 1995, over 25,000 K-12 Bay Area students have participated in the program. More than half a million dollars has been distributed in cash and prizes to almost 1,000 youth winners. This year’s theme, “Letter to the Senator,” brought in more than 500 entries from students of all backgrounds and ethnicities. Submissions included art, essay, poetry and videos that highlighted important issues that Senator Kamala Harris, the first Indian American and second African American woman elected to the U.S. Senate, should address. Students voiced their concerns around topics such as the well-being of immigrants and refugees, access to education and language services, racial justice, and environmental protection. They also revealed a heartening perception of the United States in which they saw a country where diversity ties people together, a country at peace with other nations, and a country made of immigrants that welcomes immigrants. Students also sent messages of encouragement to Senator Harris to make changes for the state and for the country. 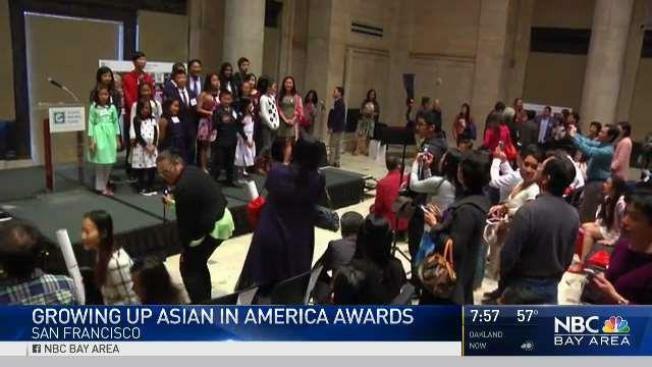 Contest winners accepted their prizes at an awards ceremony at San Francisco’s Asian Art Museum. A poster of the winning entries were also unveiled at the ceremony, which will be distributed to more than 200 libraries throughout the Bay Area in the month of May to celebrate and commemorate Asian Pacific American Heritage Month. To see the Growing Up Asian in America 2017 winners, click here.